“One martini is alright,” counseled the late James Thurber. As with the martini, so with debt. Assume an economy in doldrums. Debt appears to offer a hand up. The initial dose of debt brightens the economic spirits, livens the pace of commerce, sets the idle machines of industry awhir. The customer rapidly yields to debt’s liquidy charms… as a man yields to the womanly charms of the enchantress. He is hot for more and orders a second round. The first — after all — set things swinging. But this second dose of debt dizzies the senses… and fogs the judgment. In an economy prodded by debt, projects are undertaken that would not otherwise be. Popular industries are targets of overinvestment. A spree of debt-fueled consumption is soon underway. This business is unsustainable in the absence of more debt. The preceding boom will collapse in a heap without additional debt to hold it up. The barman is instructed to mix another libation — the third. It keeps the night going. But this dose lacks the stimulating effects of the second, much less the first. Only a fourth round of debt — an even stiffer round — can work the trick. Down the gullet it goes. But a fifth, stronger round is required to hold the previous four together. And so a fifth, stronger round it is. By now the poor fellow is 100% out of his wits, all senses deranged. Comes a point when the barman will serve him no longer. He is presented with a tab — and what a tab. The roughneck manning the door then drags him outside and heaves him upon the pavement. He is a man undone. “A worldwide debt default is a real possibility,” laments Daily Reckoning affiliate John Mauldin. Total global debt has increased an alcoholic $57 trillion since 2007. But is the globe $57 trillion wealthier? The world’s leading economies — America, Europe, Japan and China — are brewing up debt at a rate 10 times greater than economic growth. The national debt pre-financial crisis was roughly $9.5 trillion. The United States government has since borrowed some $11.6 trillion. And to show for it? The American economy expanded only $5.1 trillion these past 10 years. That is, while GDP has increased 35% since 2008… the national debt has increased 122%. 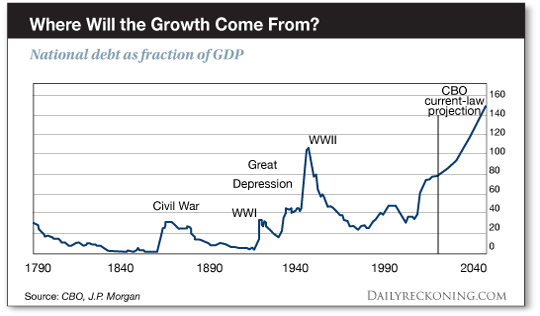 Fifty years ago, $1 of debt yielded perhaps $4 of economic growth, real or otherwise. Every borrowed dollar since 2008 has generated a mere 44 cents of output. Last year it churned out even less. Lacy Hunt is executive vice president of Hoisington Investment Management Co.
That is, last year’s borrowed buck wielded 1,000% less whizbang than 50 years ago — if our English major mathematics do not betray us. And so the Keynesian “multiplier” is reduced to a sad, sad caricature. It lives on mainly in the economics departments of ivied institutions and castles high in the sky. Debt-based consumption is a dreadful addiction. It ultimately reduces the blood to sludge and the liver to rubble. It steals from the future to satisfy today. It brings tomorrow’s consumption forward to today, that is to say… and leaves the future empty. Meantime, federal debt is rising perhaps three times the rate of revenue coming in. And trillion-dollar annual budget deficits are on tap through the next decade. Economists Carmen Reinhart and Kenneth Rogoff have demonstrated that annual economic growth falls 2% per year when the debt-to-GDP reaches 60%. What is America’s current debt-to-GDP ratio? Sustained federal deficits and rising federal debt, used to finance consumption or transfer payments, will crowd out future investment; reduce prospects for economic growth; make it more difficult to conduct routine policy, address major new priorities or deal with the next recession or emergencies; and impose substantial burdens on future generations. To simply hold current debt levels even, CBO estimates Congress would have to increase revenues 11% each year… while simultaneously hacking the budget 10%. Will Congress spend 10% less each year? Some questions answer themselves. Here you have one. Meantime, CBO currently projects economic growth to limp along at an average 1.9% per annum the next decade. That 1.9% stands in contrast to the 3% average annual rate common before the great gale of 2008 blew on through. One percentage point may not appear dramatic — and one year to the next it is not. But multiply it by five years, 10 years, 20 years… and you acquire a grim lesson in the meaning of negative compounding interest. The cost of debt is increasing… and beginning to bite. Interest payment on the debt is rising faster than any other federal outlay. 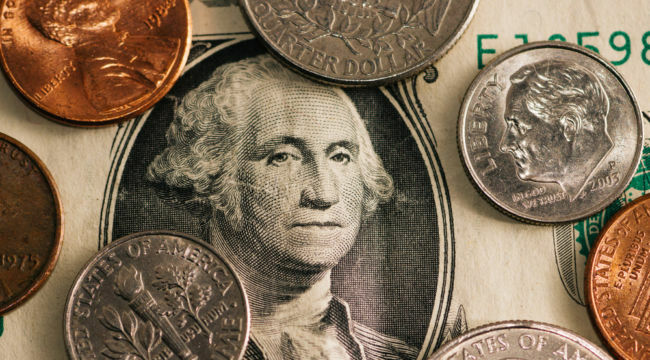 The United States spent $523 billion servicing its debt in fiscal year 2018 — a record. And CBO projects debt service will rise to $915 billion by 2028 — nearly 25% of the entire budget. $915 billion roughly approximates this year’s combined Medicare and Medicaid costs… for perspective. We suspect Nemesis will come calling one day… and exact her full payment. When that is precisely, we cannot say. But one martini was alright. Two was too many. Unfortunately, three was not enough.